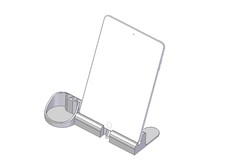 Office stand for your ipad mini with small tray holder with place for two pens/pencils. Charge while standing, small grove cut into bottom of the stand to allow cable to be wedged in. I have not printed this but included the models for possible editing. Enjoy.